Blue and white striped train engineer hat. 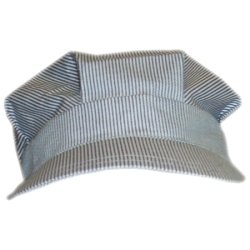 This hat is perfect for dressing up as an old time train engineer or as a fun dress up accessory while playing with model railroads. If you want a truly authentic look, then add some of our charcoal powder to simulate the look of coal dust. Hat is available in child size fitting up to a 22" head measurement.